A large number of children who run away from their homes use the railways as a mode of transport. In an attempt to escape situations of abuse or neglect at home—or lured by the glamour of ‘big city’ life—these children inadvertently end up in precarious situations of further abuse and exploitation. Railway stations across the country have not only become transit points for trafficking but also locations where a large number of children go missing every year. These children are extremely vulnerable and often become victims of various forms of abuse; physical, sexual, emotional—as well as economic exploitation. They often end up living on streets, in market places or at railway stations. To ensure the care, protection and wellbeing of run-away, unaccompanied and trafficked children who come in contact with the railways, Railway CHILDLINE was created. Committed Community Development Trust (CCDT) implements this initiative, in partnership with Childline India Foundation and the Railway Ministry, at CST station in Mumbai. CCDT has a trained team of outreach workers that patrol the station 24×7 to keep an eye out for trafficked children. CCDT also operates a kiosk at the station that provides round-the-clock assistance to children who are lost or are in distress. Since the launch of CCDT’s Railway Childline program in 2014, around 800 children have been rescued. Given that police and railway officials play a key role in cases received through Railway Childline, CCDT organized a week-long campaign during Child Rights Week (November 14 – 20) to generate awareness about the helpline and sensitize police officers. Public awareness activities included street plays, rallies, children’s competitions, open house activities and visits to hospitals, police stations, and schools. 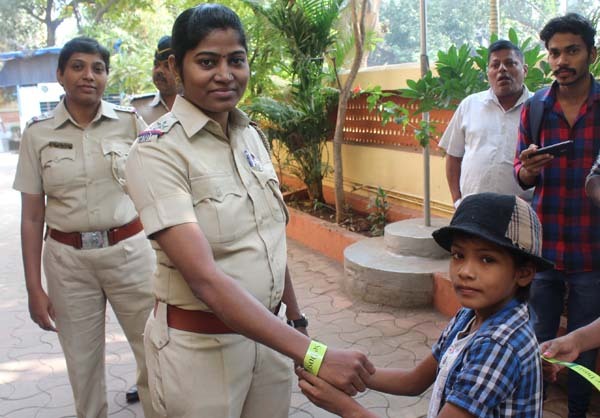 CCDT’s Childline team members along with child volunteers went to the Dahisar Police Station to tie a ‘Dosti band’ to all the police personnel and through this gesture sensitize them to the program’s objectives.